The Esagon design is based on a single piece cast unit comprising of a bed/twin column/trunnion support structure. 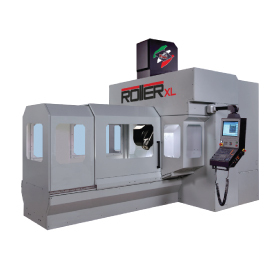 The patented reversible table offers the user the choice between a rotary index table for 5 axis work or the diametrically opposed flat table for larger components. The 120M/min rapid traverse rate, combined with high speed trunnion, indexing makes the Esagon ideal for high speed machining.